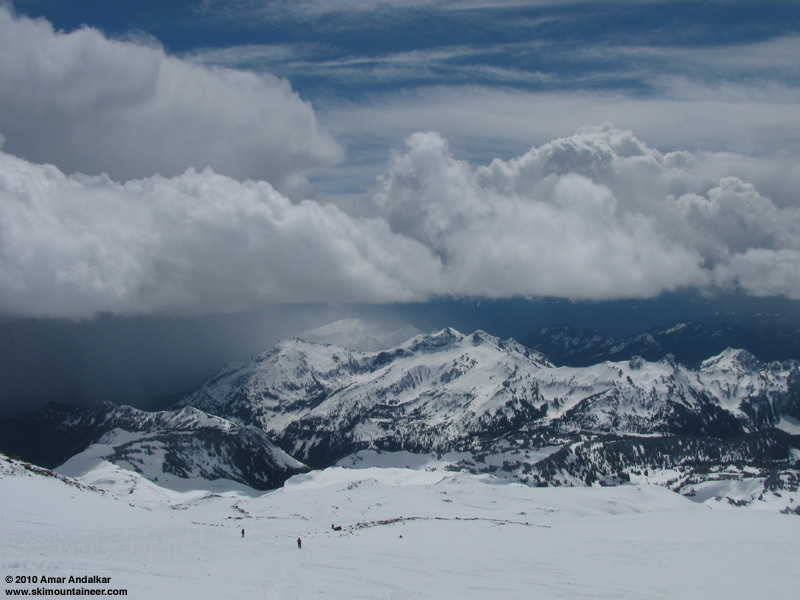 May 7, 2010, Mt Rainier, Muir Snowfield, SO GOOD! But this turned out to be really outstanding snow, totally smooth all the way from Muir to the parking lot, never sticky or gloppy even on the lowest part. Really surprising and amazing, but hard to describe: not powder, not corn or even proto-corn, just a few inches of silky smooth snow atop a firm base. Perfect for arcing huge GS or super-G turns across the wide open spaces. Among the best conditions overall top-to-bottom I've ever skied in nearly 90 ski trips to Muir. It looked like the high winds during Monday's storm had built a firm wind-packed base, topped by a few inches of snow which fell at cooler temps with almost no wind, producing the magnificent smooth surface at all elevations. Skinned up around 10:20am, on firm snow which required ski crampons to ascend Pan Face. Sunny with very light wind. Reached Muir at 1:20pm in a modest SW breeze, as ominous clouds built all around and dense showers poured from many of those to the south. Skied down after a brief break, trying to beat the incoming weather. Barely did, and it was SO GOOD, smooth and swift and joyous. The Snowfield itself was all very fine, and even the most wind-hammered section, from 7500 to 7000 ft after McClure Rock, was smooth and nice if you followed the nice snow. And the steepest sunniest part of Pan Face, skier's right, held just a couple hundred vert of real honest corn snow. Even below Pan Point, the firm crusty snow of the morning had transformed into smooth buttery goodness in the vernal sunshine. As I expected (despite the NWAC special avalanche forecast), snow conditions were completely stable on this (mostly windward-facing) route, and no signs of avalanche activity were observed. Big serac falls from Nisqually Ice Cliff and Icefall, though. Just above Paradise, stopped to chat with Greg and Riley, who were heading up for an overnight summit attempt, but about to be foiled by the incoming showers and whiteout. 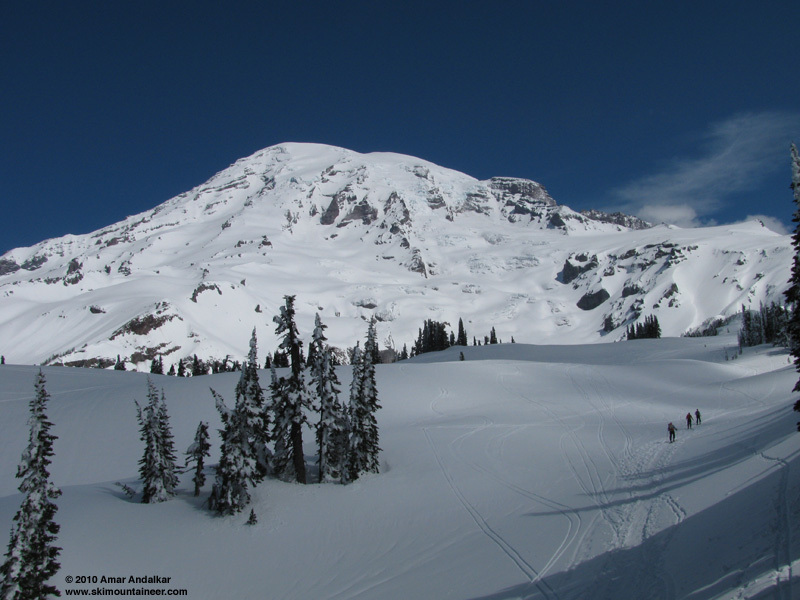 After telling them how amazing the snow was, we decided to come back the next day and make an attempt on Little Tahoma -- see next TR. SYNOPSIS...A WEAK TROUGH AND LIGHT SURFACE FLOW WILL WILL RESULT IN� PARTLY CLOUDY SKIES AND WARMER TEMPERATURES ACROSS WESTERN WASHINGTON THROUGH THIS WEEKEND. SHOWERS AND ISOLATED THUNDERSTORMS WILL BE LIMITED TO THE MOUNTAINS DURING THE AFTERNOON AND EVENINGS. AN UPPER TROUGH WILL MOVE ACROSS THE AREA MONDAY BRINGING A CHANCE OF SHOWERS. AN UPPER RIDGE WILL BRING DRY WEATHER AGAIN TUESDAY AND WEDNESDAY...WITH A WEAK FRONT MOVING INLAND ON THURSDAY. FRIDAY...PARTLY SUNNY. A CHANCE OF SHOWERS AND ISOLATED THUNDERSTORMS IN THE AFTERNOON. SNOW LEVEL 4500 FEET. FRIDAY NIGHT...MOSTLY CLOUDY. A CHANCE OF SHOWERS AND ISOLATED THUNDERSTORMS IN THE EVENING. SNOW LEVEL 5000 FEET. SATURDAY...PARTLY SUNNY. A CHANCE OF SHOWERS AND ISOLATED THUNDERSTORMS IN THE AFTERNOON. SNOW LEVEL 4500 FEET. SATURDAY NIGHT...MOSTLY CLOUDY WITH A CHANCE OF SHOWERS AND ISOLATED THUNDERSTORMS IN THE EVENING...THEN PARTLY CLOUDY AFTER MIDNIGHT. SNOW LEVEL 4500 FEET. SUNDAY...PARTLY SUNNY. A CHANCE OF SHOWERS IN THE AFTERNOON. SNOW LEVEL 4500 FEET. SUNDAY NIGHT THROUGH THURSDAY...PARTLY TO MOSTLY CLOUDY WITH A CHANCE OF SHOWERS. SNOW LEVEL 5000 TO 6000 FEET. 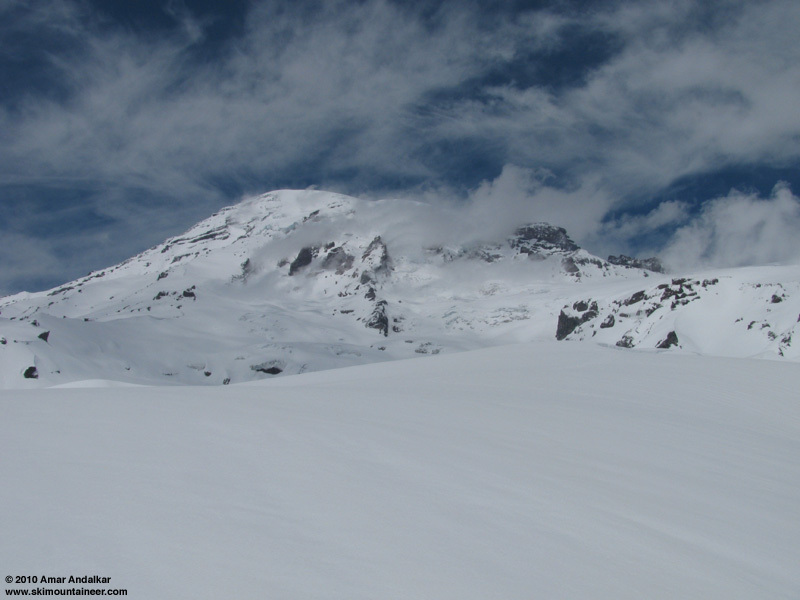 Re: May 7, 2010, Mt Rainier, Muir Snowfield, SO GOOD! Your description of the snow makes it sound like what Russ and I encountered on the Roman Wall a bunch of years ago in early July - fresh firm packed snow that had softened just slightly and was just the best smoothest spring/summer line I've ever encountered. I've since talked to enough folks who have skied the Roman Wall in survival-ski conditions to realize how lucky we were. Timing is everything - nice job reaping the harvest this weekend! Agreed. That was a fun day. My only compliant was that the ride down was over way to quick. Left Muir at 2:45 and was back at the parking lot at 3:00. Basically a non-stop ride all the way down.